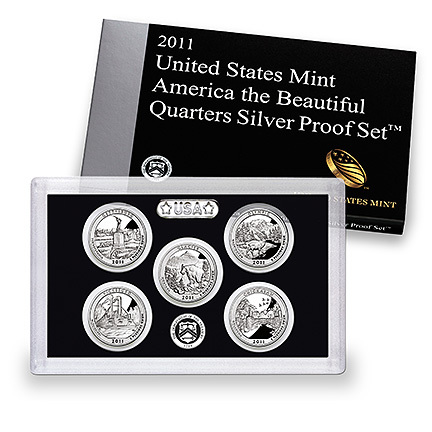 The 2011 United States Mint America the Beautiful Quarters Silver Proof Set™ will feature 90% silver examples of the 2011 releases of the America the Beautiful Quarters Program®. Coins in the program represent sites of national interest from around the country including one from each state, the District of Columbia and the five territories of the US. The selected sites are honored with a design emblematic of the location on their reverse. This set includes examples of the sixth through the tenth releases of the program which debuted in 2010. Coins of the set are struck from 90% silver to proof quality. Coins are encased in a protective lens to preserve their finish. A release date for the Silver Proof Set has been announced for March 29, 2011. An issue price for the set has not yet been announced by the US Mint. An "S" on each coin in the set indicates they were struck at the US Mint’s facility in San Francisco. John Flanagan’s portrait of George Washington is shown on the obverse of all of the America the Beautiful Quarters. It was first featured on the circulating 1932 quarter dollar. Reverse designs are emblematic of the selected site.